There’s only one thing worse than showing up early for a holiday gathering — turning up empty handed! 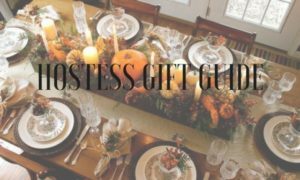 Luckily hostess gifts can be as simple as a bouquet of flowers or a bottle of wine, but we’ve pulled together some of our favorite items that add more of a personal touch. Whether it’s a monogrammed item like this pretty copper ice bucket, or a seasonal reed diffuser to scent the home, we’re keeping these items on hand for our gracious holiday hosts!